A friend of mine came to visit. She had decided to be a blessing so, I in return wanted to be a blessing as well. I gave her a 2 oz. 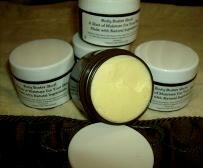 Jar of our All Natural Body Balm. It is made with natural ingredients(Raw African Shea Butter, EV Olive Oil, Evening Primrose, and Karanj Oil just to name some)and has no preservatives. I just wanted to be able to give her something so, I also included some of our fragrances from the Fragrance Cafe’. Her response was much better than expected, especially the next day when she called very early in the morning, it’s always good to wake up to a praise report, going on and on about how soft the Body Balm made her hands feel. She even went on to mention that it is better than a particular name brand that she uses, but of course I will not name, but I’ll just say that a lot of “us” use the brand. Any way she was so pleased with it that she wanted me to create her a larger jar because we only make the 2 oz. Body Butter Shot and the 4 oz. jar of the product. I am so pleased at how well this product is going over. It makes me want to get out my creative hat and go back into the lab to create something else. You can find out more about this product by going to our Fragrance Cafe’ page on Facebook. This blog is to mark the transition of my life as my husband and I step out on faith to find a new home church. God began to reveal some truths to us about faith a couple of years ago and He desires us to be in a place where we can grow in what He has begun to reveal to us. We started visiting this one church and our spirit leaped within us as we sat in the first service. God began to speak to us about some hurt that we suffered and we received what God had for us that day. The musical portion of the worship service blessed us from the first sound. The freedom of expression in worship is one of the things that we were looking for so, this made us feel right at home. As the word went forth we began to feel some long chains fall off of our minds. It was truly a pleasant and inspiring experience. Later that week we went back for bible study and more of the same happened. We were able to see where we had been programmed to think a certain way, which God had already began to reveal truth, and now those things were being broken off. Liberty began to truly engulf us and make us free. Skip ahead to week number two in this adventure. We are on our way to church and as we were on the road about to turn down the road in which the church is on, I felt a “boom” and then the car slid. Puzzled, and startled, I admit I said “what the hell? !”…I looked at my husband and he said I think the axle just broke. I thought to myself, “you have got to be kidding me.” He got out and popped the hood and looked under there and said, “yep, the axle broke.” I just couldn’t believe this was happening. My husband got back in the car and calls his friend, who owns a towing service, to request help. He agreed to help, but stated that he wouldn’t be to the city for about 3 or 4 hours. I thought to myself…are we suppose to just sit here?….my husband informed his friend that the care would be parked on Outer Drive at Stotter. He looked at me and said, “baby, were gonna push this car to the side and walk on down to the church.” At this point I’m thinking, are you kidding me? I thought we were going to sit here and wait for the tow truck, its cold, I have on 3 inch heel boots. Now you’re probably thinking oh my God, what in the world? But I am one who has learned to be submissive to my husband regardless of whether I think he’s right or not because I know that it pleases God that I obey Him. So, honey directs me what to do and gets behind the car to push, and out of nowhere a gentlemen comes to our aid to help push and then disappears down the street. We parked the car, I said, “I plead the blood of Jesus over this car” and we walked on down the street. The good thing is that my heels were the thick kind so, they really weren’t hard to walk in, but the enemy began to bombard my mind with things and for a minute I began to wimper as I walked. This continued for a minute until I began to think about how we could’ve been at the half way point and further from the church and home so, I thanked God for allowing us to be so close to the church. Then I thought about the fact that we were suppose to have my mother in law with us that morning, but she wasn’t feeling well enough to come with us so, I thanked God that we didn’t have to have mother out here in this weather walking on a cane down to the church. I thought about the fact that nobody was directly behind us in the turn lane to crash into the back of us as the car abruptly came to a stop so, I began to thank God for His divine protection and timing upon us and with us. Then I just began to pray in the Holy Spirit because I remembered that the bible instructs us to build up ourselves in our most holy faith by praying in the Holy Ghost. Then I just began to recall all the scripture that I’ve studied, read, and confessed about God taking care of us, being our shepherd, no weapon formed shall prosper, all things work together for good, the father knows the things that ye have need of, my God shall supply all of your need according to his riches in glory by Christ Jesus, the Earth is the Lord’s and the fullness thereof, the world and they that dwell therein. I just began to remind God of His word. We got to the church and the musical portion of worship was high and in full swing so, they held us at the door so as not to break the moving of the spirit. So, just as I stood there I raised my hands and began to praise God right where I stood until they allowed us to go to our seats. When we got to our seats, I set my stuff down and went full on into the presence of God praising Him like I always do, loudly and with tears. I told God that “it looks bad, but I trust You Father.” “You are my God, my shepherd, my king, my Lord.” I mean I just praised him with abandon because I began to realize that this was an opportunity for God to yet again show us who He is. We stayed for the whole service and God encouraged us even in the midst of the service. We were able to get our car towed to where we wanted it, get food to eat, buy the axle for the car, and set up for it to be fixed the next day and then get home safely, warm, and sound. I was exhausted so once we got home, I ate and went and laid down, thanking God for how he took care and caused everything to line up for us in spite of all that had happened that day. I could have just allowed the enemy to fill my mind with a bunch of junk about how we were broke and wouldn’t be able to get the car fixed, and how we had nobody to come to our aid and nobody really cared about us anyway. He even stooped so low as to tell me that if we would’ve been still going to the other church somebody would’ve came directly out to get us. I’m so glad that God’s Word is my source and answer for my life concerning everything in my life. The Word of God will sustain you, strengthen you, encourage you, and cause triumph to come to you. There are angels assigned to minister for heirs of salvation, of which I am, and they respond to the voice of God’s word. When we speak the Word of God, He hastens to perform it by sending forth ministering angels to bring us into His best. Now the next day is a whole other story…but you’ll have to come back to read that. Thanks for your time today and joining me on my adventure on the road home.